So plush...makes our bedroom look so lush. Blissful indulgence without breaking the bank, this excellent mink faux fur throw is made from premium polyester with an excellent fur-like finish that's impressively stylish and outstandingly cozy. Durable and long-lasting, this excellent piece is conveniently machine washable and easy to take care of, and comes in six brilliant color options. overpriced. For what I paid for this 1 one sided fur throw I could have gotten FOUR locally faux fur TWO sided fur. I would have given excellent if it had been really plush....example if both sides were the same...it would have felt very luxurious. As it is it is not very warm. Way overpriced for the quality. 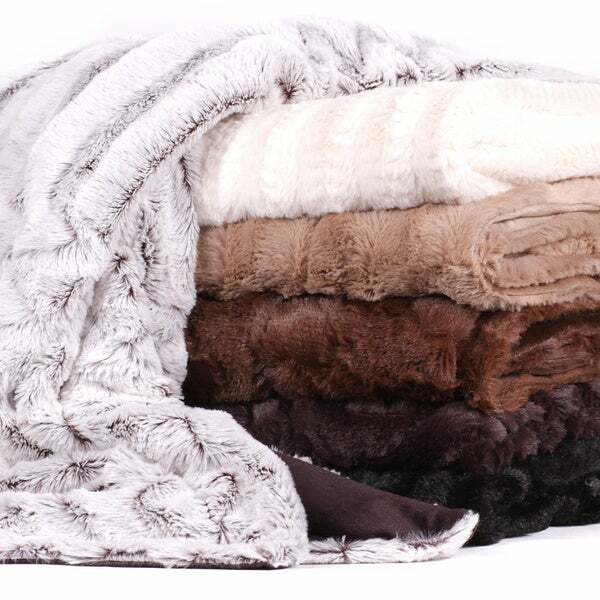 This Plush Reversible Mink Faux Fur Throw is an absolutely beautiful throw. It is very soft and great for cold weather. It also makes a great gift! I have a couple of these mink faux fur throws on my couch. I use them to keep the cat from scratching at the arms. I'm not sure where the reversible comes in but they are nice looking and feeling. We ordered the plum color for my daughter's room. The color was very rich (clearly fake...not sure of the last time I saw a plum-colored mink!) and handsome. We have had the throw for 5 months. It does not shed nor mat. Very pleased! This blanket is very soft and nice. Unfortunately, I changed my mind on the style of blanket I wanted, so I returned this item. But it had nothing to do with the quality of the item! Great buy if you're looking for a soft blanket. The plum color is perfect also! I was leery about the color since it doesn't look very plum online, but it was definitely a true plum. Soft, faux fur throw. Nice size, looks expensive, color is same as pictured, I would recommend to a friend. Light weight and easy to fold, so it looks nice when not in use. Super fluffy, my family fights over! This is a super cozy blanket that everyone fights over, during movie time in the den...I should have bought more! It is super easy to clean and the quality is great. It doesn’t shed like some of the other faux fur blankets I’ve bought in the past. I am thinking of getting more as gifts! This was great price for the quality! Bought this for Mom to use during summer. Perfect to throw over one's lap when the air conditioning is on. It is smaller and more lightweight than other throws. I bought the brown one here and it looks beautiful on my desk chair. Very soft and has been washed a lot and still beautiful, doesn't shed and it's fabulous to sit on and lean back on too. The blanket is so soft - my daughter loves it. It gets a lot of use because she takes it everywhere to cuddle with it. we now have a popped seam because of the extra use but I think I can sew that up rather easily. I haven't tried to wash it yet - I am hoping it holds up well. So luxurious my cats took it over! Nice light weight throw. Not as plush as it appeared in the photos, but a decent quality for the price. this throw looks so cheap. not worth the money and is very thin!!!! need I say more? a bit smaller than others offered elsewhere, yet it's a nice compliment to the living room's design. I bought this to put on my ottoman at the end of my bed. Nice to throw over yourself on a chilly night while watching movies. It is actually bigger than I expected. Beautiful, thick and soft. I bought it as a gift and he loves it. Says it's very warm. I highly recommend this throw. I love this throw. It is so soft and lightweight and is the perfect size. It washes well and does looks great on the back of the couch. Very soft and luxurious. Generous size. Nice neutral color. Not too feminine. Perfect accessory for our den. Causuall but elegant at same time. Love this throw, and washes great, and still feels great. Definitely would highly recommend. Great product value with a great price. The variety of colors options are great. I looked everywhere for throws in stores, and nothing stood out to me, or felt as good as the 1 I purchased from Overstock. Throw looks good quality thin. "Hi, I really like the first throw on the very top of the picture but not sure which color it is as it doesn't look like any of the colors mentioned? It looks like a white/silver with a black shadow? Please advise what color and if available in that color, thanks." "what is the difference between the boxed and the ribbed faux fur throw"
I'm not really sure. It has lines like ribbed would be. It is the size of a throw not a blanket. "In the large picture what color is that one?" "When will the wavy plum be back in stock?" "Is the plum color blanket like a shade of purple? Would it match a purple blanket???" The plun color is a purple tone. It should match your blanket if it is the same tone. "I have a queen sized bed and would like to use this as a thin comforter, would it be big enough? What are the measurements of this blanket?" Hello KristenS23, dimensions are approximately 60 inches long x 50 inches wide. Yes this will be fine for a queen size bed. Please let us know if you have any further questions. Hello Suzywong, the country of origin is China. Please let us know if you have additional questions. Thanks for shopping with us.